President Barack Obama announced Friday a series of administration initiatives to help veterans find jobs once they return to the U.S.
AFPS reports the president proposed a series of tax credits for companies hiring veterans, including an increase to the existing tax credit for hiring disabled veterans. The Returning Heroes credit would offer up to $2,400 for every short-term unemployed veteran hire. Long-term hires would be credited up to $4,800 per hire. 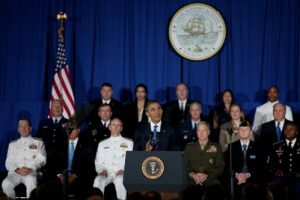 Obama also announced new a task force led by the departments of Defense and Veterans Affairs. The task force will develop a “reverse boot camp,” giving returning soldiers the training, education and credentials needed to transition into the civilian workforce or to pursue higher education. Click here to watch Obama’s full remarks at the Washington Navy Yard.